Labrador Third Eye Lid Inflammation Normal or a Problem? 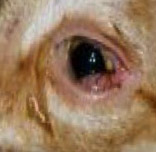 Red Dog Eyes with or without Discharge Can Indicate a Problem such as Conjunctivitis as shown Above. Reader Question: Are Red Dog Eyes a Problem at Night? I just adopted a beautiful, 6 year old, black lab mix from a local shelter. Since she is my first dog, I have a question about what I'm seeing when she starts to fall asleep. It appears as though her eyes turn red. I'm assuming it is her third eye lid and thought its red appearance was probably normal. Now, though, I'm wondering if I am overlooking a problem. I've had her for three weeks. She also has quite a bit of eye discharge in the mornings - usually after she's been awake for a while. When she first wakes up, her eyes seem very watery. I've already taken her to a vet to establish a relationship and asked about the amount of discharge. He kind of just fluffed it off. Should I be concerned? Under normal conditions, a dog’s third eyelid shouldn’t be red. A somewhat pink color can be normal, but redness is often associated with inflammation. It sounds as if your dog also has a bit more eye discharge than what I would consider normal. I tend to approach cases like this by first performing a thorough exam of the eyes and surrounding tissues, followed by a few simple tests including an eye pressure check to rule out glaucoma and internal eye infections, an eye stain to look for ulcers, scratches, etc. on the surface of the eye, and a test of tear production. If all of the results are normal, the owner and I will then have to decide if the symptoms are significant enough to warrant a continued work up or if the most reasonable option is to simply keep an eye on things… no pun intended.